On September 7, 2017, we celebrated the opening of the exhibition Abstract Expressionism: Looking East from the Far West at the Honolulu Museum of Art (HoMA). The picture above shows one of the boxes returned to the library from the European/American Art Department a little while ago. 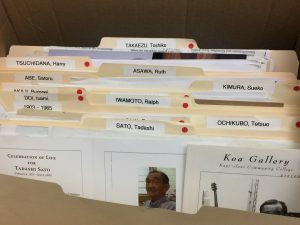 The red dots on the folders indicate Artists of Hawai‘i, and they are the most heavily requested artist files among thousands of folders stored in the library. 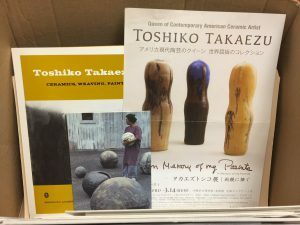 Many of those Hawai‘i-born artists in the show don’t have national recognition yet they are the local icons whose work is easily seen while driving and walking in town. During the exhibition HoMA created a slate of public programs including a digital guide to the public works by Asian American Abstract Expressionists and organized the Honolulu City Bike Tour. Besides newspaper clippings and magazine articles, the artist files contains invitations from other museums and galleries and biographical information such as memorial service programs handed out by their families. We can find friendships and local networks between artists and the community from our artist files. Contents of Kaua‘i native Reuben Tam’s artist file. Reuben Tam was in the Abstract Expressionism exhibition, and his Islanding: Reuben Tam is on view until October 7, 2018, in the museum’s Works on Paper gallery. 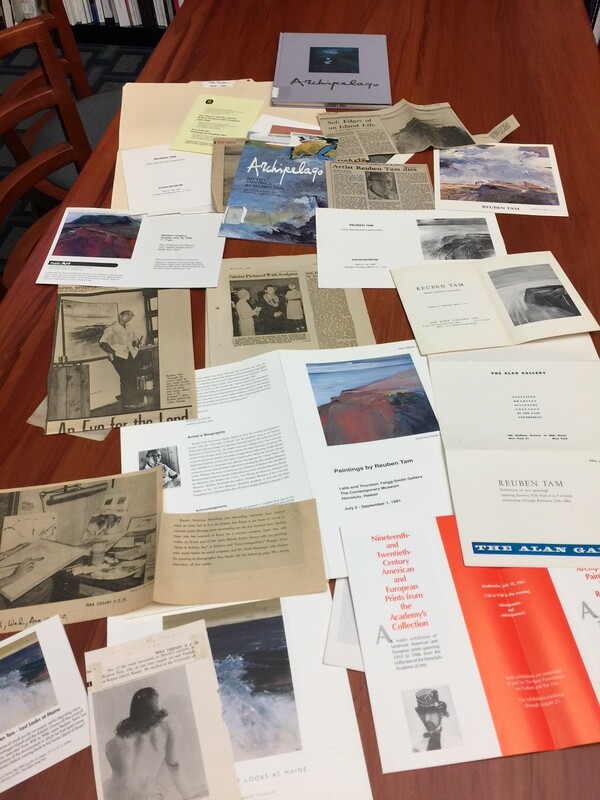 We hosted the first meeting to discuss archival resources on Asian American modernist artists from Hawai‘i last week. Each of us — archivist, historian, collector, scholar, and librarian — have been working on materials specializing in local artists and seeking possibilities for collaboration, including the potential for developing Hawai‘i module – a digital platform to preserve and share. How to frame unrecognized Hawai‘i-born Asian American artists (in the Smithonian collection there are 105 Asian American artists and 15 are/were from Hawai‘i) and develop web-based resources of untold stories and facts that are largely absent from the existing databases? I’ve found a new mission from the discussion, that is, to extend the research of exhibition history to museums in Asia and add those findings to our artist files. I am dreaming many of Hawai‘i’s young artists will have exhibitions in the mainland and one day be featured on the popular magazines, following our local heroes like Bruno Mars and Barack Obama.